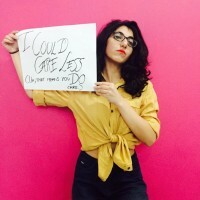 She's not anti-feminism, and we'll explain why. She was at the receiving end of quite the uproar. And then, while the media was unleashing curls of fire at her for being anti-feminist, she responded with a comment that, I'm sure, she thought would have a band-aid effect, but instead dug the grave far deeper. Here's the trouble, though. You shouldn't be hating on Lisa. You should be annoyed at the flagrant ignorance that surrounds the term 'feminist'. I'm tired of people saying 'bra-burning' and 'butch' and all the other 'B' words that flock around this term unnecessarily simply because, for so long, that has been the notion of the feminist. There's a certain sect of women that are allergic to the word feminism because, you know, God forbid men think you're a scary, protest-sign carrying, jhhola-wearer and the idea makes you less desirable. Heavens, no. You like your lipstick and Louboutins, and wouldn't want the world to think of you any other way. The thing is, feminism is FINE with that. Feminism has absolutely no problems with anything associated with femininity. It is not the nemesis of femininity. It doesn't mean that you CAN'T cook dinner for your husband, or have babies, or HAVE HUSBANDS. It only means that it is your prerogative—not your duty, not your obligation; your PREROGATIVE, to do it. A zillion people have said it before, and I'll be the zillion-and-one-th. Feminism is equality. Bold, italics, underline. No 'if's, no 'but's, no muss, no fuss. no extras, no dress code, no placards required, no religious beliefs, no political views. Just equality. Plain and simple. And it's that equality I'd like to take a minute to explain. Because while everybody focusses on the 'choice' aspect (something we have to, and will keep, fighting for), the 'onus' part is skipped over. Yes, feminism is equality. It is the ability to choose like men (not BE like men, as Lisa accidentally insinuates), to be free like men, to be given respect like men. It is also taking ownership of the fact that this equality comes with responsibility. It means not expecting men to naturally, organically fulfill the role of provider, and for women to naturally, organically fulfill the role of nurturer. It means not expecting to be taken care of financially by a man (unless you've had a legitimate discussion, and decided to assign roles that work for you both) because it's 'the way of the world'. It's understanding that you are an equal being–in all your strength–to everyone you compare yourself with. And that means choice AND responsibility. 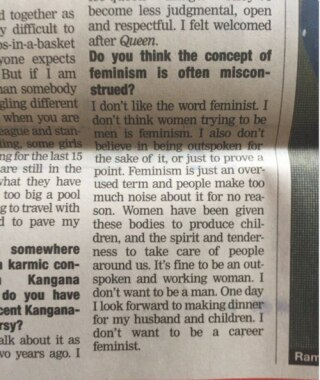 Now, the thing is, I've interviewed Lisa at length several times—and I know she's actually NOT anti-feminist. 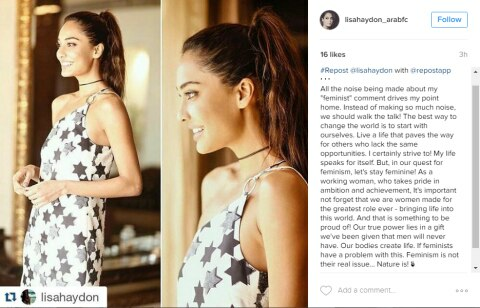 She's very taken by the idea of having children, and thinks marriage and motherhood are both beautiful things, and she seems to be championing that to the point of destruction in her public statements. The thing is, the common misconception is that wanting certain 'traditionally feminine' things has been lumped with being anti-feminist. And that is something not only Lisa thinks. Several women, when asked if they're feminists, are quick to respond 'no', because God knows what notions that word is associated with. That if you SAY you're a feminist, you stop being the woman you currently are. If only everyone would understand that the minute you want to be considered equal to absolutely anyone else, you're a feminist. You don't have to wear it on a T-shirt, you don't have to shout in your social media posts. All you have to do is please, please understand what it really means to be one.